When we heard the news from Brussels, our first thoughts were for Dan's brother John and our beloved sister-in-law, Ilse. Ilse grew up in a small town near Antwerp and she and John now live in Antwerp. 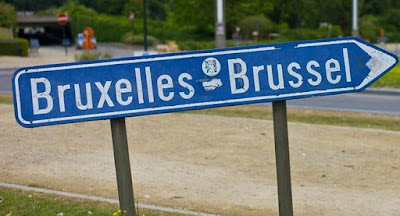 Belgium is a small country though and Brussels is less than an hour from their Antwerp home. John and his business partner travel a lot and the Brussels airport is a regular part of their working life. 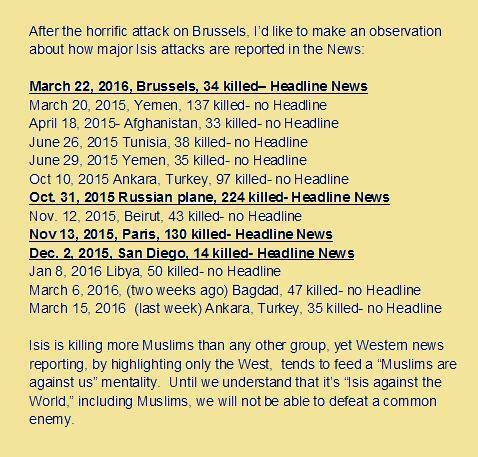 Thankfully, our family and friends in Belgium are safe. 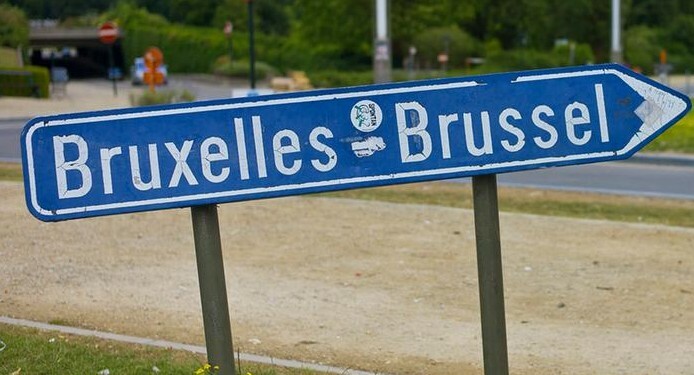 This brings the Brussels tragedy close to home for us. Paris too — not because we have family there but we do know people who live there and we've been there not that long ago ourselves. It hits us a little harder because we know the streets and the landscapes and the people's routines. We need to be reminded though that tragedies like these play out every day in places that don't get the same attention as Paris and Brussels. The big headlines are saved for our big familiar cities and somewhere on page seven, we see the news from more distant lands. Thinking about this took me back to September 11, 2001. As many people do, I remember where I was and what I was doing when the airplanes hit the twin towers in New York. I saw the second one hit the building live on television. I spent the next several days watching TV, listening to radio, reading newspapers soaking up every detail of an attack that was closer to home than we were used to. A few days after the attack, I managed to find one of the last copies of the black-covered New Yorker on local newsstands. 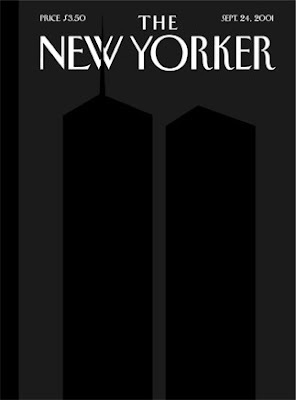 I read almost everything in that issue but I was particularly struck by the Talk of the Town near the front of the magazine — a series of short essays by writers who had been in New York on that fateful Tuesday. There were contributions from John Updike, Jonathan Franzen, Denis Johnson, Roger Angell, Aharon Appelfeld, Rebecca Mead, Susan Sontag, Amitav Ghosh, and Donald Antrim. They're all worth reading but after all these years, there's one paragraph that has stayed with me and that I've quoted several times, often on the anniversary of September 11. It's from the essay by Denis Johnson, a writer who in the years preceding 2001 had reported from Somalia, Afghanistan, the southern Philippines, Liberia — among other so-called "hot spots" around the world. He writes that he wondered what it would be like if he had to do such reporting in his own land, how he would feel and react. And here he was, after seeing and hearing and writing about so much horror in other parts of the world, experiencing the violence and suffering and carnage here at home. On Thursday, as I write in New York City, which I happened to be visiting at the time of the attack, the wind has shifted, and a sour electrical smoke travels up the canyons between the tall buildings. I have now seen two days of war in the biggest city in America. But imagine a succession of such days stretching into years — years in which explosions bring down all the great buildings, until the last one goes, or until bothering to bring the last one down is just a waste of ammunition. Imagine the people who have already seen years like these turn into decades — imagine their brief lifetimes made up only of days like these we’ve just seen in New York. The very thought of it breaks my heart. "Imagine a succession of such days stretching into years . . ."
If you want to read the whole Talk of the Town, you can find it here. So well put, Sharon. Thanks!